We are once again riddled with a stressful problem. Chooey and Rin got into a fight. It was awful. I had isolated them from each other the night before, but it wasn't meant to be. This morning, Chooey was carried back to her area with really bad puncture wounds. Also, whenever she opened her mouth, she would tilt her head sideways. I was dead worried that I decided to bring her to the clinic immediately. The lady vet removed the fur from the puncture wounds but while they were removing it and she was squirming. They accidentally held the area where her jaw was and she made a piercing scream. We had her x-rayed to find out that Chooey's right mandible is broken. Of all the places, why should it have been there? The veterinarian said that it had probably been due to the impact of Rin's bite which was supposed to be a through and through (right directly below her eye). She also had two puncture wounds just above her brows and the area between her eyes. 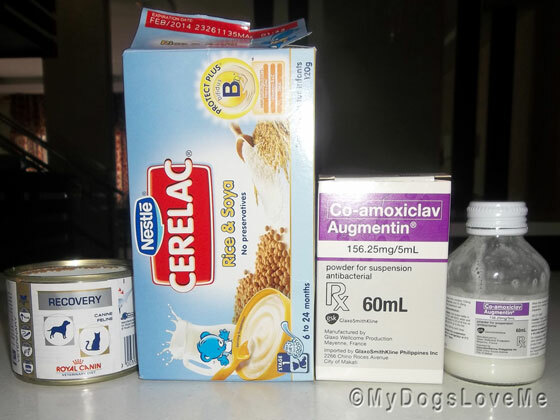 This is part of Chooey's medication and diet. Soft diet composed of Cerelac and Recovery Food. Tolfine 60mg for pain and Augmentin for infection. The vet said that we would need a brace to repair her jaw and the surgery alone will cost 9,000 php. That's a lot of money and it just breaks my heart that this had to happen to her. I made sure to notify the household that Chooey was to remain at the bottom, but somebody had opened the hatch to which she bolted towards Rin. A fight commenced and I just found out of her wounds an hour later because it happened early in the morning. This is the best we could do in the mean time because of the inflammation. Now, Chooey's not to open her right jaw which makes this even more unbearable. The level of aggression is awful. Have they all been neutered yet? We are so very sorry to hear this. We hope Chooey will be OK. All paws crossed. This must be very difficult situation. Our paws crossed for Chooey's recovery. Thank u guys for your sweet comments. Oh Chooey, I is so sorry to hear that you is hurting. Sometimes us Big Dogs forget just how powerful we is. I hopes you get better really soon. Oh no poor Chooey I'm sorry to hear that your hurting sending healing licks for a quick recovery. Poor Chooey. Dog fights can be awful. We mostly have loud, snappy spats, with no contact. Oh no! That is so terrible! We are so sorry to hear this happened. Poor Chooey. We are sending big prayers and healing energy. OMD that is just terrible. We are so sorry to read what has happened. We are sending big love, POTP and all our prayers that Chooey makes a good recovery. We are thinking of you. Let us know and update when you can. 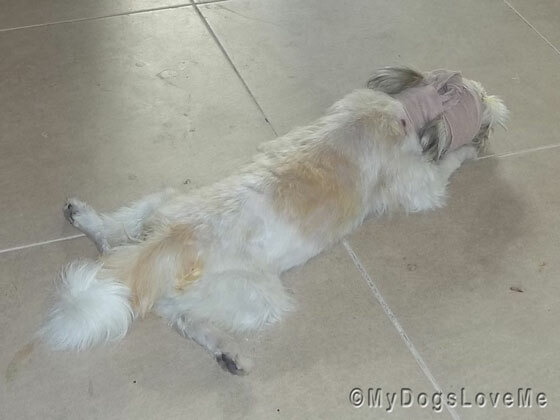 Poor Chooey, we hope she feels better soon. Oh no…poor Chooey. I hope she will be okay. Sending lots of hugs and healing thoughts your way. How very sad.. hugs for Chooey! We are so sorry to heasrt this news. Chooey will be in our hearts and prayers for a speady recovery. Happy Mom's Day to your Mommy. We are so sorry. We will pray for her recovery and that they will get along. We have had trouble getting our male dogs to get along. Finally we just built fences on the farm to seperate them all. Hope things go better for you! Sending to poor Chooey our strongest White Dog healing energies and positive thoughts that she will recover entirely well. We hope they both will find a way to peacefully coexist and no further harm will come.